Two weeks ago I mentioned long-tube valerian in a post. This plant bedevils me. 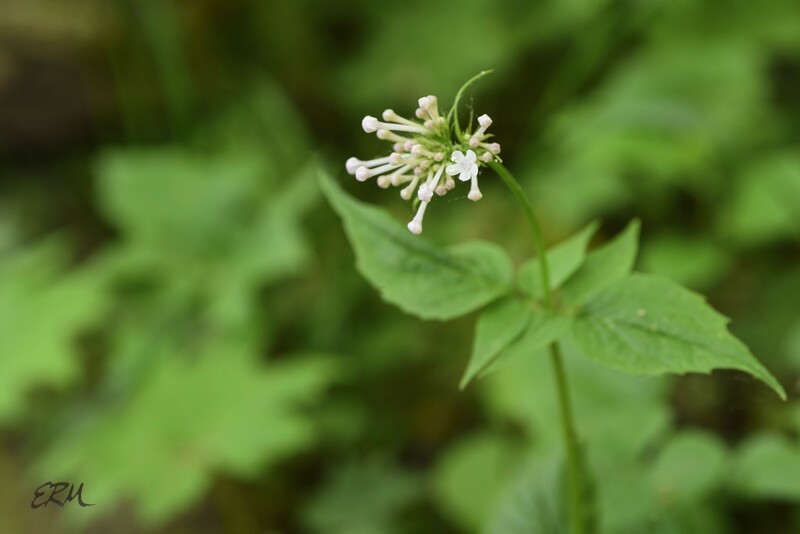 It grows in the deep, deep shade of the woods, often along the banks of seasonal streams and in other very moist soils. 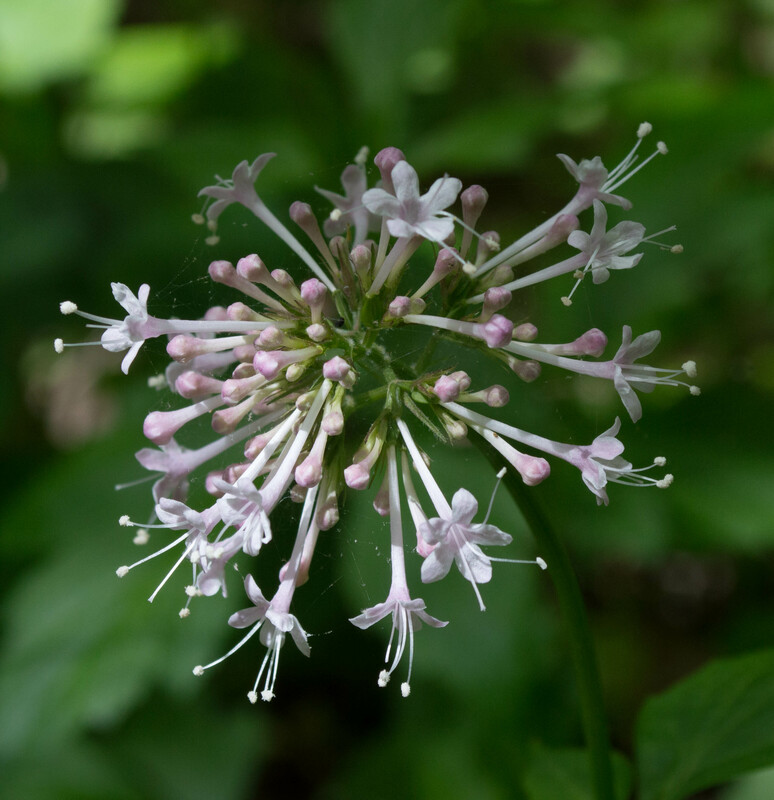 The deep shade makes it difficult to photograph, especially since I need to use a very small aperture to get the entire inflorescence in focus. Valeriana pauciflora, whose other common names are few-flowered valerian and large-flowered valerian, is in the Caprifoliaceae (honeysuckle family), and is listed S1/endangered by the Maryland DNR. Its native range is restricted almost entirely to the Ohio River drainage basin, along with a few occurrences on the lower Susquehanna River, central Maryland, and northern Virginia. 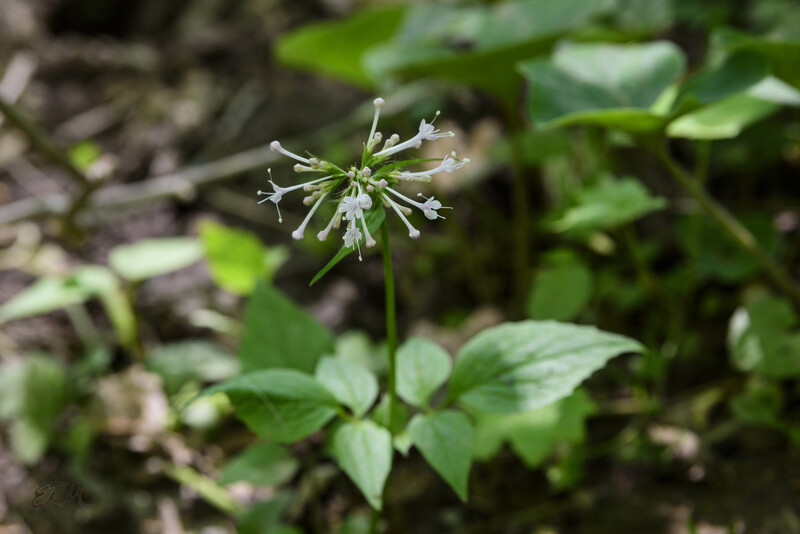 The plants I’ve seen consist of a single delicate stem that grows to about two feet tall, sporting a terminal cyme of flowers. 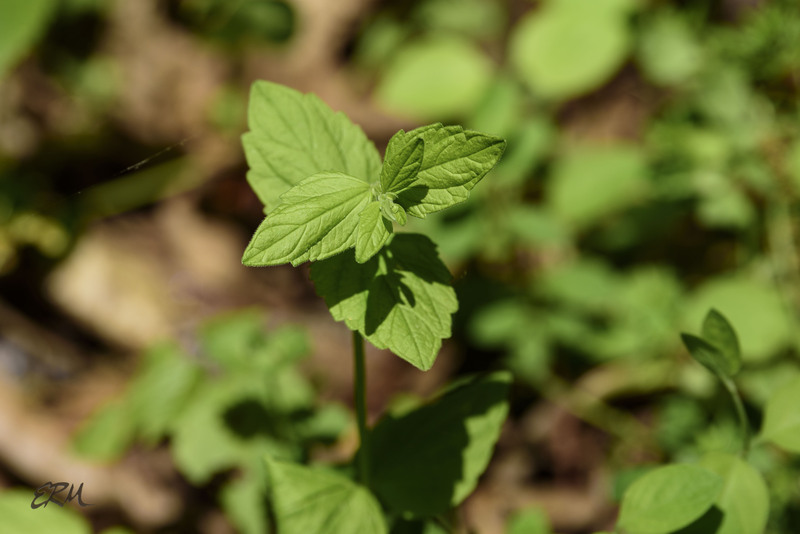 The compound leaves have 3 leaflets each, the terminal leaflet often with an elongated tip. According to descriptions I’ve read in other sources, there can also be inflorescences in the upper leaf axils; sometimes these are described as panicles rather than cymes; also, the leaves can have as many as seven leaflets. 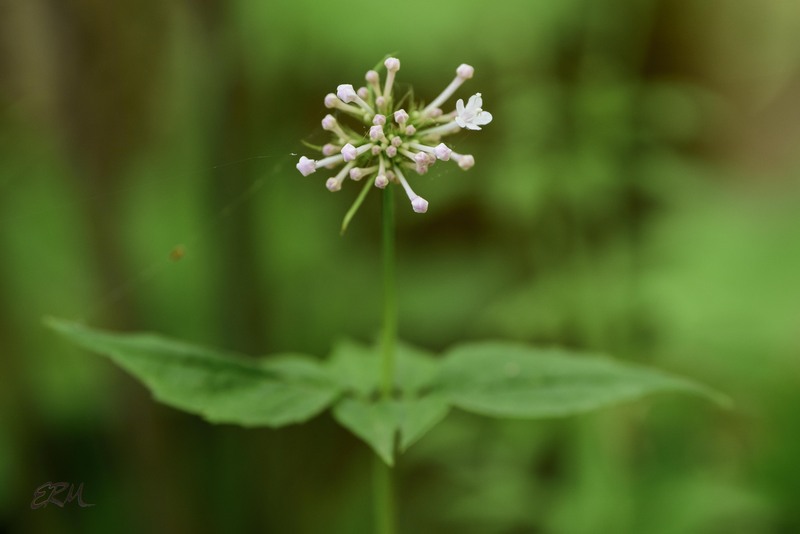 The are fourteen other Valerian species found in North America, only one of which is in the mid-Atlantic (barely). I’ve never managed to do it justice in pictures. This one from 2014 is still my favorite. But I’ll try again next year. It was raining, and the forecast said rain all week, but then there was a window of a few hours between downpours. 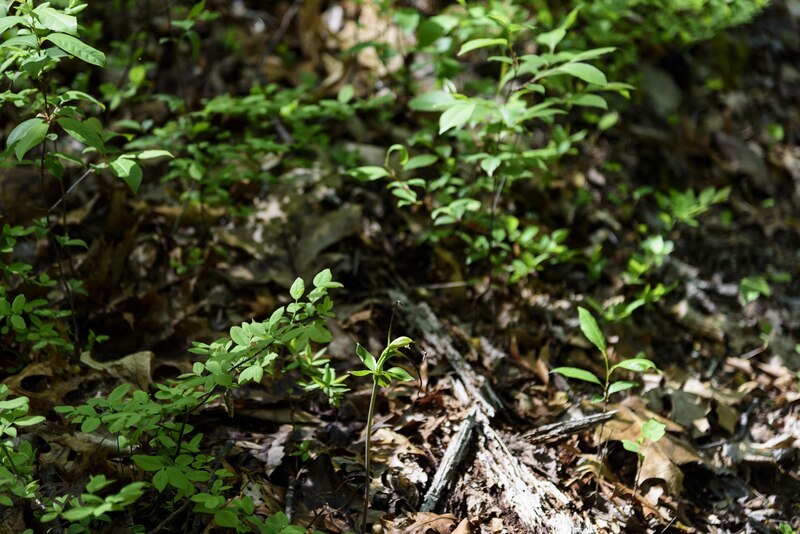 Thinking about the plants that might be Scutellaria nervosa, I decided to take the camera on a quick hike to the site and check. I was sure they wouldn’t be flowering yet, since a week before they had just the tiniest little buds on them. I was wrong: they were already flowering. But, I was right: they are S. nervosa! 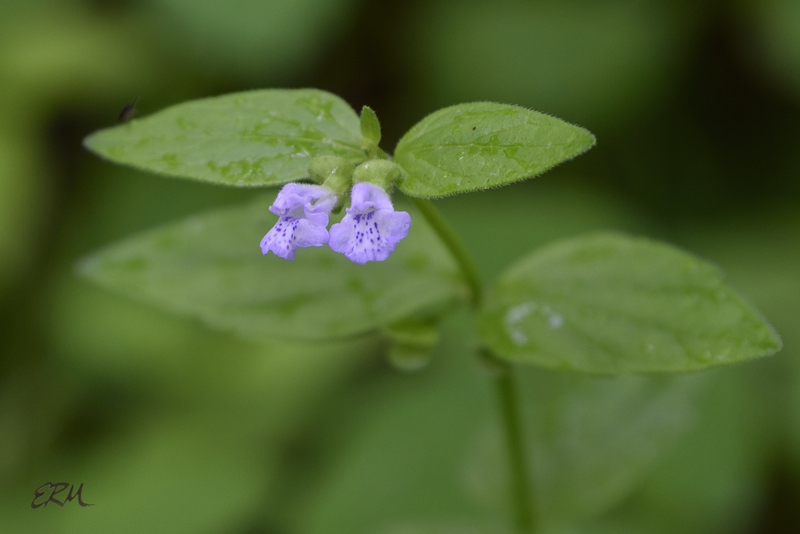 Veiny skullcap is one of ten Scutellaria species found in Maryland. All are native, and half of them are on the RTE list (veiny is ranked S1S2). The species is globally secure; the only other jurisdiction listing it is Michigan, where it’s threatened. Its native range is more or less the Ohio River basin and somewhat east of that into the mid-Atlantic states. 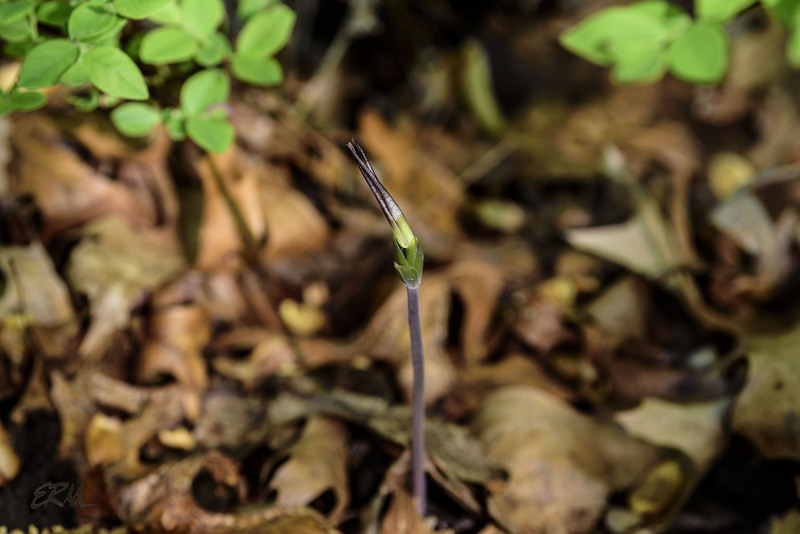 This is a slender forb growing to about a foot tall, with a single stem. 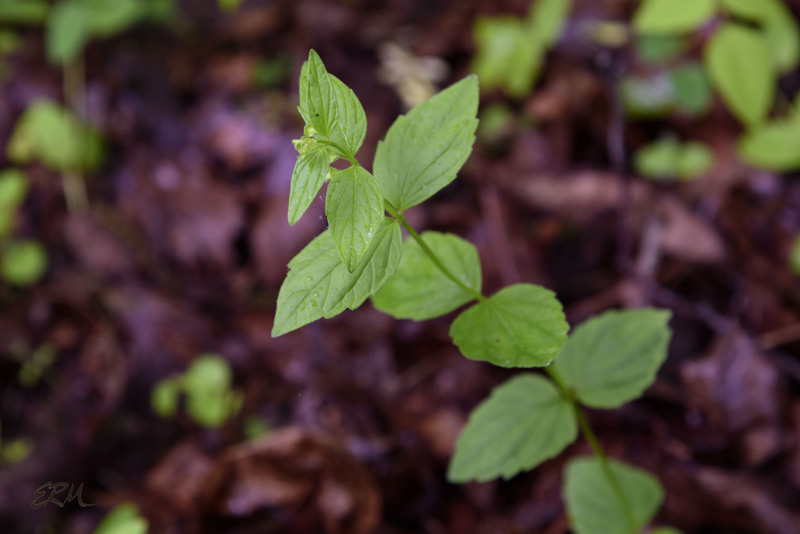 The lower stem leaves are ovate and dentate, and may have short petioles, while the upper leaves are elliptical, less dentate or almost entire, and sessile. 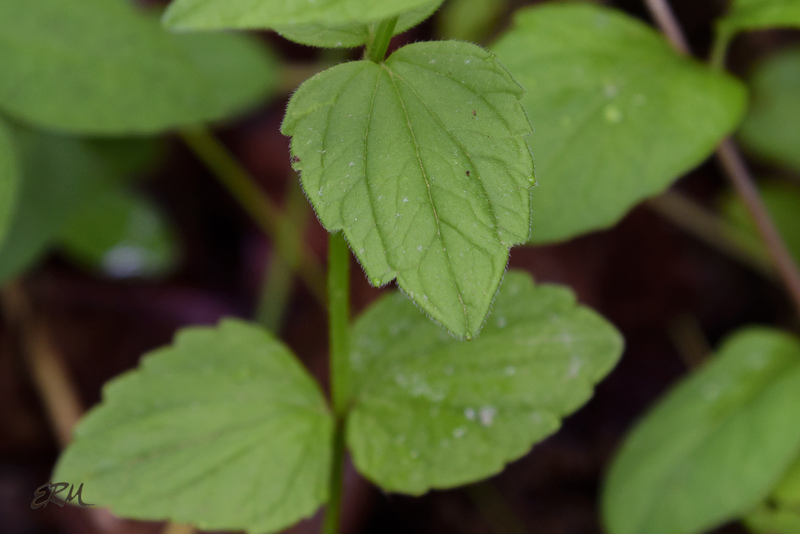 The upper leaf surfaces are lightly covered in hairs, and the margins are more densely hairy. 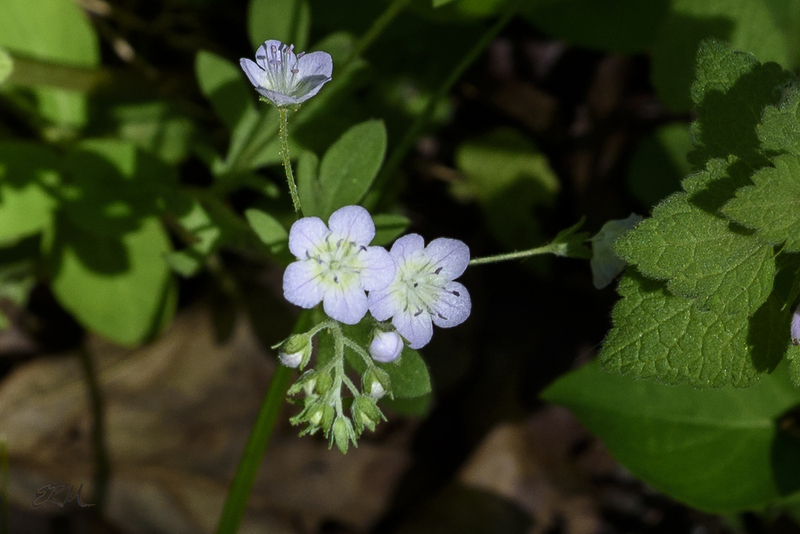 The light blue, pendant flowers are borne in pairs in the upper leaf axils. They aren’t very showy, and sometimes they hide under the leaves, so they’re easy to miss. 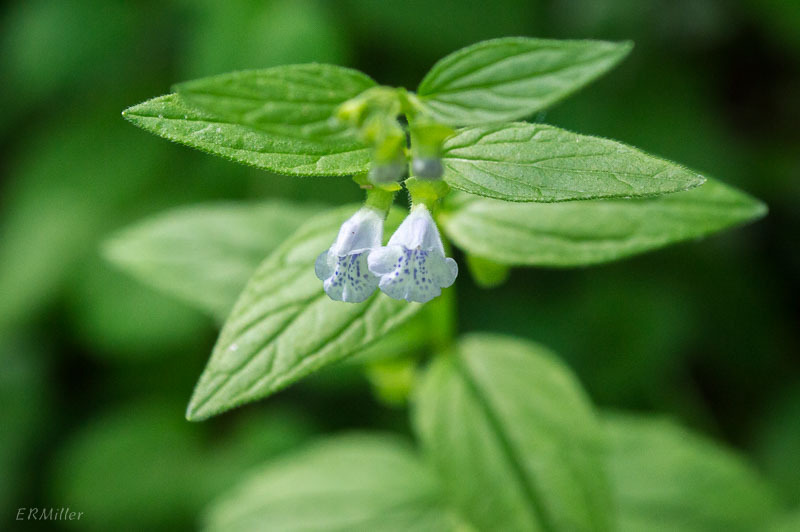 If you find veiny skullcap in Maryland please post in the comments section! We have very few records for this species. What a week I had last week! It started with orchids and ended with multiple RTE sightings. 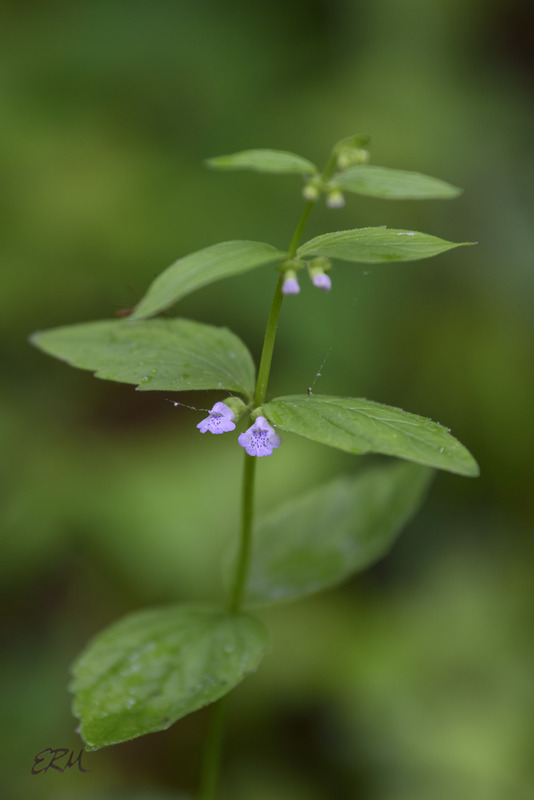 I re-found Scutellaria nervosa (S1S2/highly state rare; endangered) on the same day I pulled weeds from a stand of Valeriana pauciflora (S1/highly state rare/endangered). And not long after that, I came across the largest stand of Phacelia purshii (Miami mist, fringed phacelia) that I have ever seen. P. purshii is listed S3/watchlist in Maryland. Not long after that, I found a lovely and mostly weed-free patch of Phacelia dubia (small-flower phacelia), which is also S3/watchlist. I wrote about the two species (and a third, P. covillei) in April of 2017, so won’t repeat myself. I just wanted to post these pictures. 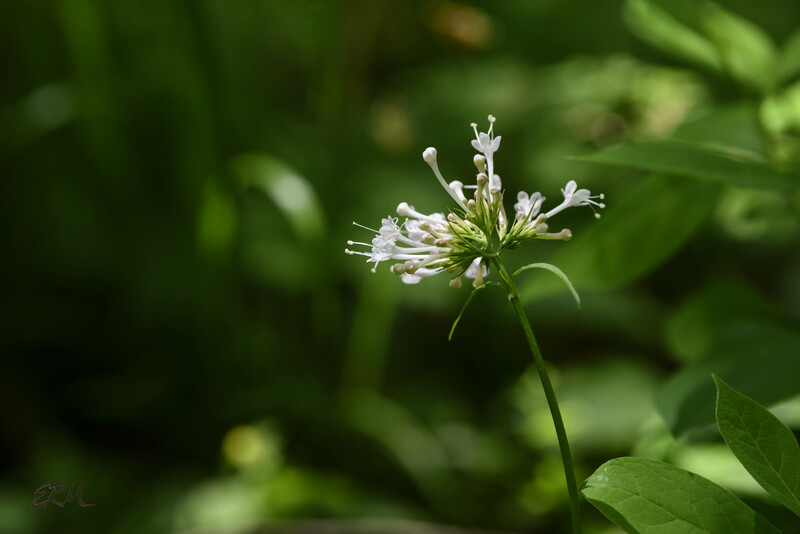 Every spring I go looking for long-tube valerian, aka few-flowered valerian or large-flower valerian (Valeriana pauciflora), a forb of wet wooded areas that sports a stunning inflorescence. In Maryland it’s listed S1/E [see my previous post for definitions]. I know of four distinct populations in the Maryland piedmont. 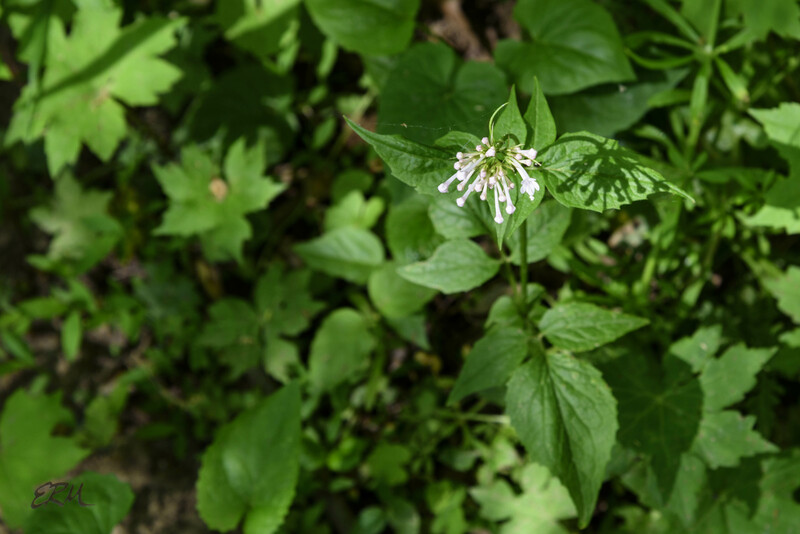 Last week I was at one of those sites, setting up the camera on the tripod, and while looking around for a good candidate (since the flowers were just starting to bloom and the dappled forest light was making annoying shadows), I noticed a fair amount of garlic mustard (Alliaria petiolata) and a few star-of-Bethlehem (Ornithogalum umbellatum), too. Those two species are invasive aliens. 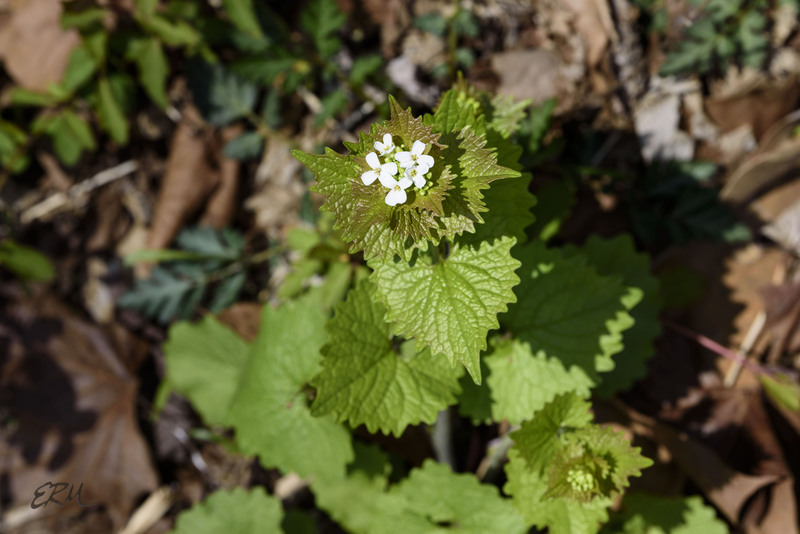 While garlic mustard is a well-known pest, star-of-Bethlehem gets less attention. The first time I saw it in those woods, maybe seven or eight years ago, there were just a few. But every year, there are more and more. 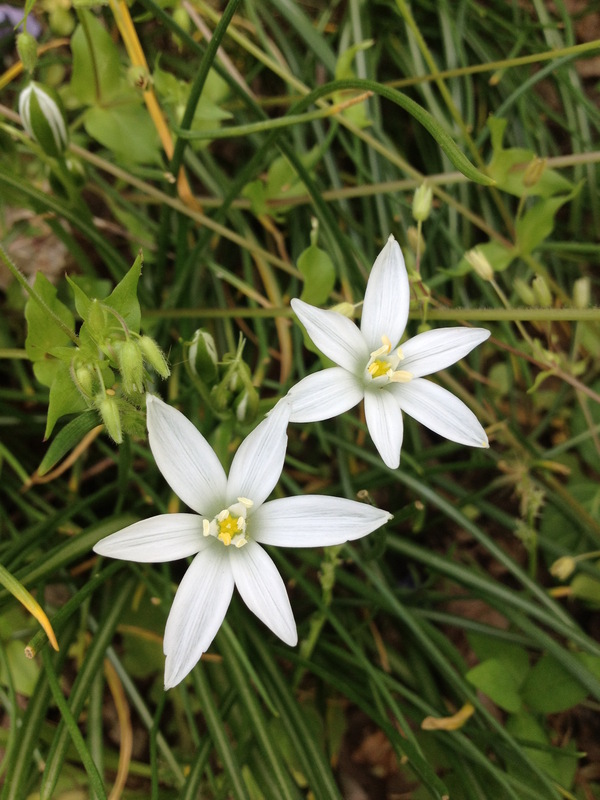 Here’s a picture of its close cousin, nodding star-of-Bethlehem (Ornithogalum nutans), invading a floodplain in Frederick County. So anyway, before shooting, I donned this vest and pulled some weeds. I don’t do this nearly as often as I should. But I took a class, was given a vest, and am therefore allowed to do a certain amount of invasive alien plant removal in a few specified areas. There are so many invasive aliens in those areas that I’ve decided to limit my efforts to places with populations of RTEs (rare, threatened, endangered species). I’m not sure who originated the Weed Warrior concept, but Carole Bergmann of Montgomery Parks started our local program in 1999, and there are others in the DMV. 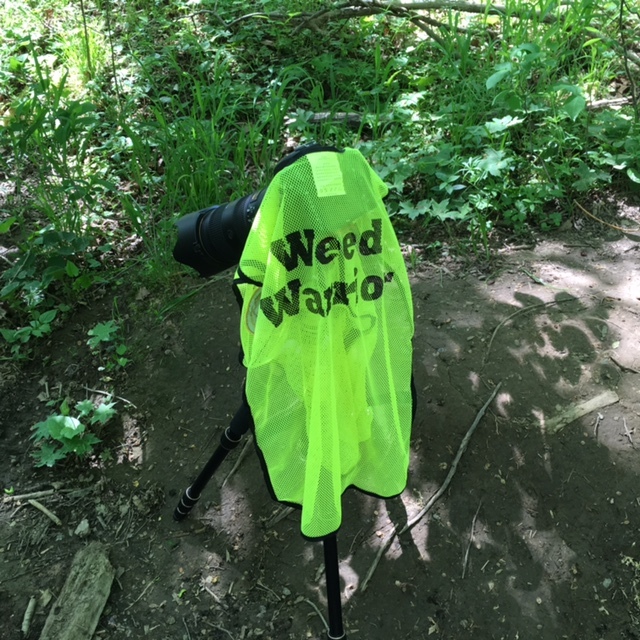 If you’re inclined to do some volunteering and make a difference, I urge you to look for a local Weed Warrior group and sign up. At the same time I strongly urge you not to just start pulling weeds. 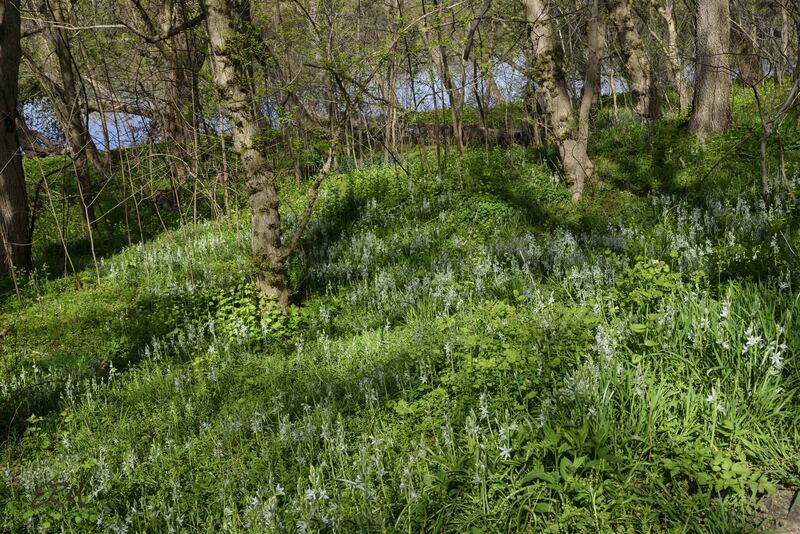 It’s illegal to do so in most public parks, unless you have permission, for a good reason: it’s easy to do real damage to native plant populations if you don’t know what you’re doing. So please, get involved, but do so responsibly. 9:04 find orchids, set up, start shooting; reposition tripod several times, swap lenses, try some hand-held shots – the usual. About 15 minutes later, check my phone. It’s 9:45. Hmm. Just a few more shots before heading back. 10 minutes later, check the phone: it’s 10:15. That’s pretty typical for me when I’m shooting anything, but it’s worse when the subject is orchids. 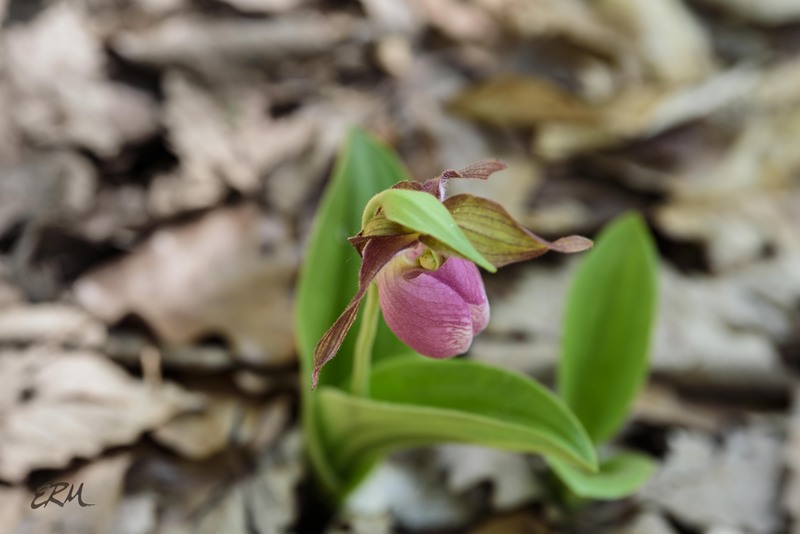 This is Cypripedium acaule, pink lady’s slipper, a terrestrial orchid native to eastern North America. It ranges from the Appalachian Mountains in the south into most parts of the mid-Atlantic, New England, the upper Midwest, and Canada. In Maryland it seems to be in all the physiographic provinces but we have the most records for it in the piedmont. It’s endangered in Illinois, unusual in Georgia, commercially exploited/ endangered in Tennessee, and exploitably vulnerable in New York. 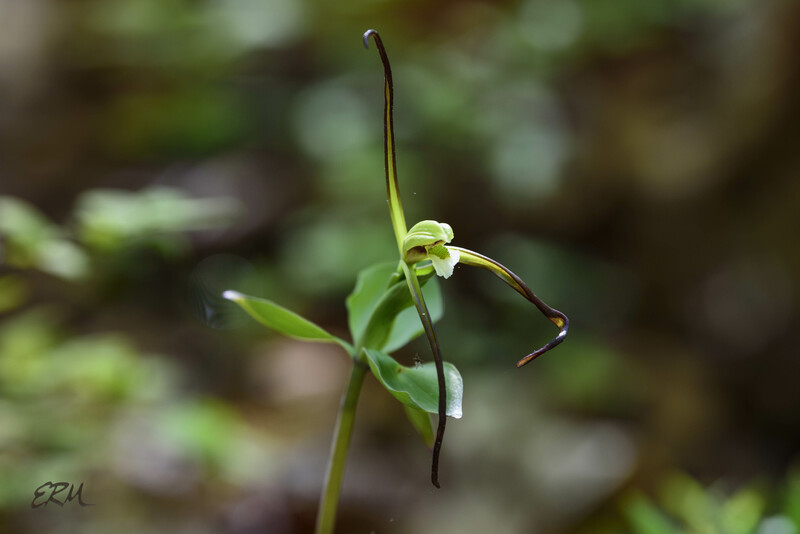 The fact that it’s exploited is particularly troublesome because, as I’ve written many times and as poachers really ought to know by now, transplanting orchids from the wild is a good way to kill them. 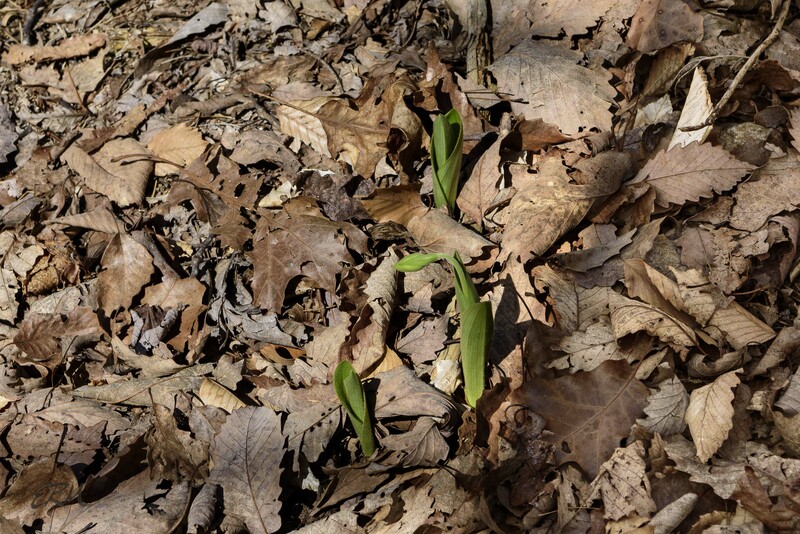 They might survive for a little while, but without the correct fungus in the soil, they won’t reproduce and will soon die. The USDA Forest Service has a nice little article with more details. 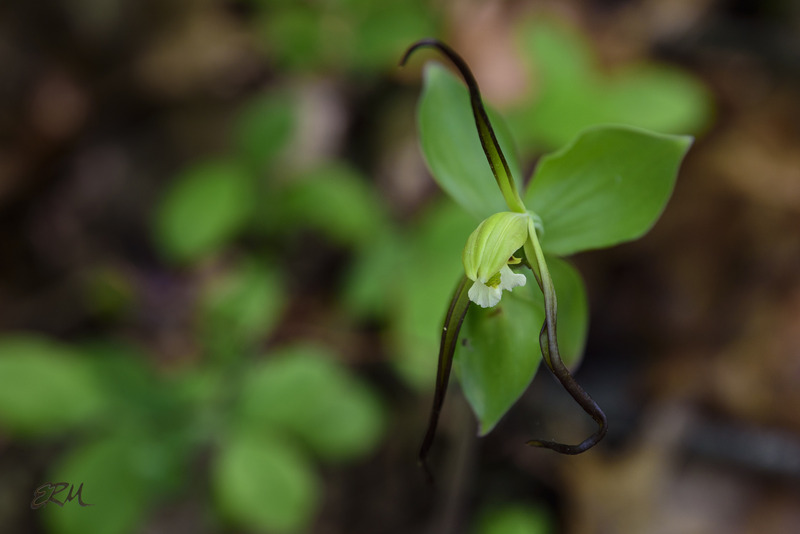 Although not on Maryland’s RTE list, this orchid isn’t common. If you find some, take a moment to lose yourself in the beauty. Sunday evening I’m on the computer, browsing various internet forums*, and I see a post from someone who’s found some nice flowers in a nearby park. 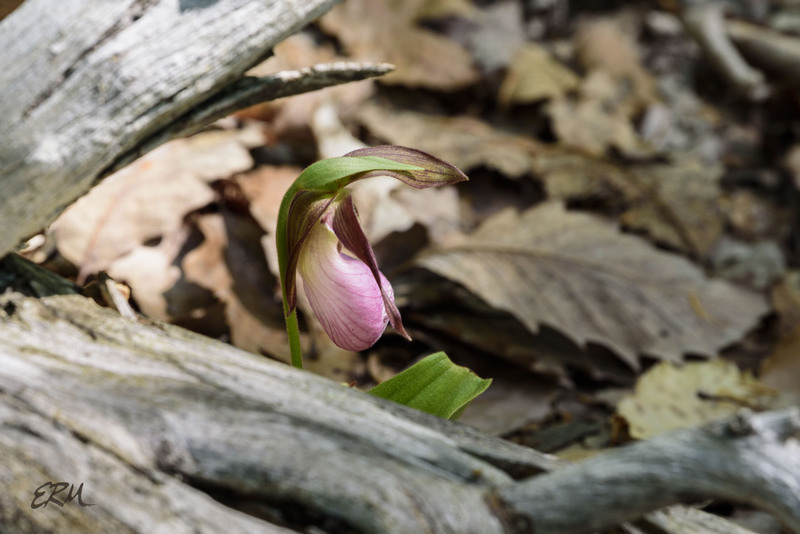 When I read the words “large whorled pogonia,” my heart skips a beat. 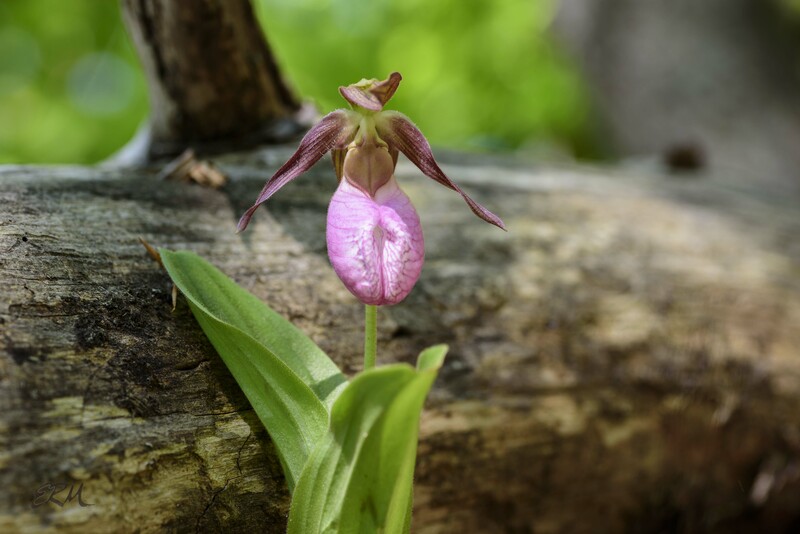 So first thing Monday morning, plans to go hunting for lady’s slipper orchids are scuttled, and off I go to add another wild orchid to my life list. Isotria verticillata (formerly Pogonia verticillata and Arethusa verticillata) ranges from eastern Texas northeast well into New England. 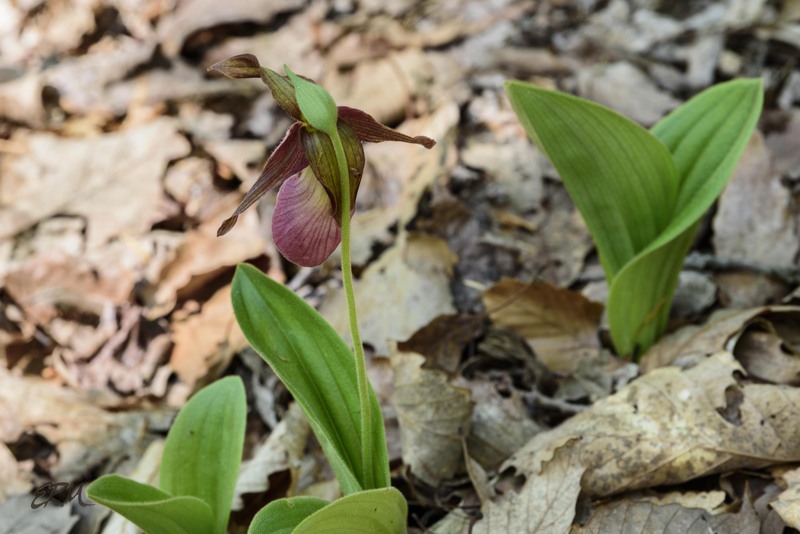 It’s endangered in Florida, Illinois, New Hampshire; threatened in Michigan and Vermont; exploitably vulnerable in New York; and possibly extirpated in Maine. But it’s secure in Maryland, where it can be found in the piedmont and some western parts of the coastal plain. 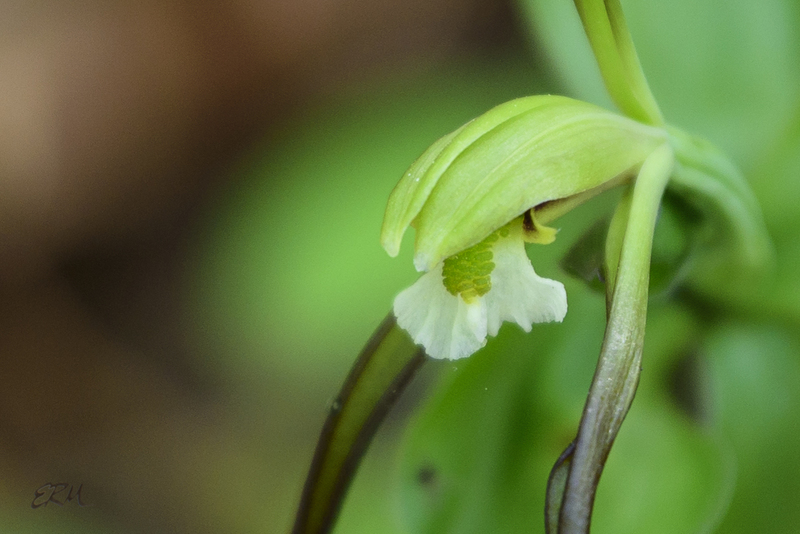 Like most orchids found in the continental US, large whorled pogonia is terrestrial. 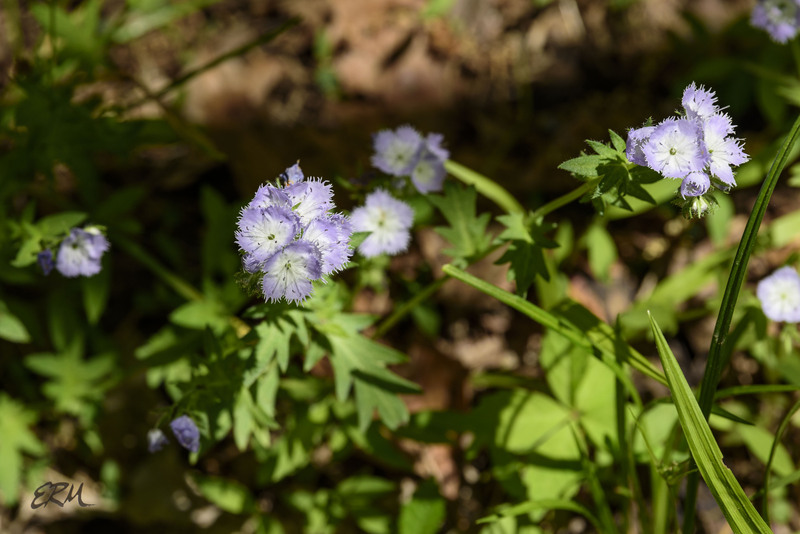 It likes moist to dry woodland soils, and is pollinated by bees. 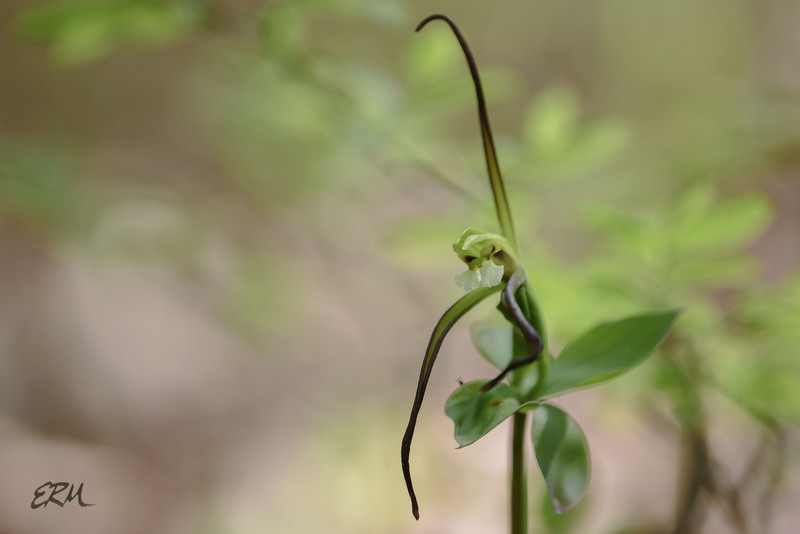 Also as is typical of our native orchids, because of specialized cultural requirements, it isn’t very common.